This question has come up a number of times in the past. However, there have been some updates that I personally was not aware of until last week. To cut to the chase, Horizon View 7 (all clone types) is supported with vSAN stretch cluster. This is good news. However, it is very important that customers should follow the Horizon View Reference Architecture (RA) design document and test the scalability of Horizon 7 and vSAN Stretched Clusters in their environment. I spoke with Graeme Gordon, Senior Staff Architect for End User Computing at VMware, about this combination. He delved into this in further detail, especially the considerations one needs when dealing with persistent and non-persistent desktops. He indicated that if the use case is non-persistent desktops, then there is one caveat to keep in mind. 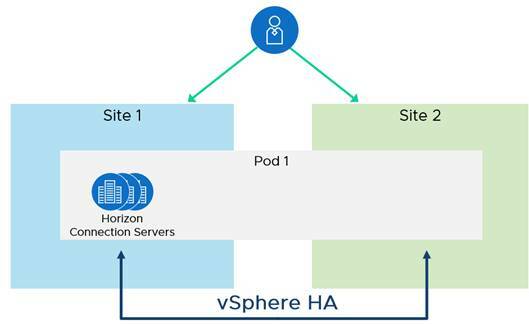 With Horizon View deployed on a stretched cluster, there is only a single Horizon Pod (set of Connection Servers). If a corruption or something else happened to the functionality of the Connection Server, then both sites of the stretched cluster would be affected. For non-persistent use case, the recommendation is that deployments of this nature are better handled with separate vSAN clusters and Pods per site, and join them together with Cloud Pod Architecture. This keeps both sites separate from an infrastructure perspective. Since the user desktop data can be extracted, this can be replicated between sites for use within the desktops – to an end-user, this makes it feel persistent. With full clone desktops, the user data cannot be extracted and injected on demand like what can be done for floating desktops. This is why vSAN stretched cluster is an ideal solution as it allows for the replication of the whole VM, regardless of what it contains. A key detail to point out are that we have one common set of Horizon Connection Servers and that they are all pinned to the one physical site via affinity rules. vSphere HA is leveraged to failover the Connection Servers to the other physical site in the case of maintenance/failures. There is vSAN stretched cluster information in the appendix of the View and vSAN Reference Architecture document. The use case described is for full clones. Non-persistent desktops are better handled with separate Pods/vSAN clusters per site, connected via CPA, as mentioned previously. This is detailed in the other user cases in the Reference Architecture. Here are some links to useful documentation on Horizon View with vSAN Stretched Cluster. AppVolumes Caveat: There is no support for AppVolumes on any sort of Stretched Cluster at this time. That includes vSAN Stretched Cluster. Kudos to Graeme for this useful information.